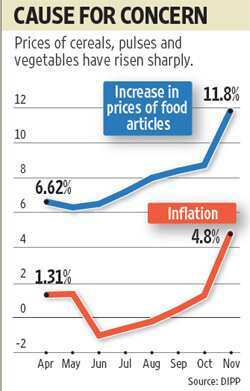 New Delhi: Soaring food prices pushed inflation to a 10-month high, putting pressure on both the government and the central bank to react. The government decided on 19 October to replace its weekly inflation data releases with monthly ones, though it continues to provide weekly inflation numbers for sensitive items on the index, such as food and fuel. There were large increases in the wholesale prices of cereals (13.57%), pulses (35.22%), vegetables (16.92%), especially potatoes (101.58%) and onions (32.41%). The price of sugar also increased by 53.76% during the month. However, prices of commodities such as minerals and iron and steel, which have higher weight in the Wholesale Price Index (WPI), declined from their last year’s level by 2.26% and 11.66%, respectively. Both finance minister Pranab Mukherjee and commerce minister Anand Sharma said on Monday that rising inflationary pressure, particularly in food items, is a “matter of concern". Inflation, which remained negative during June-August due to a high base, returned to positive territory in September. The weak monsoon rains this year, 23% lower than average and the weakest since 1972, have harmed agricultural production in many parts of the country and stretched food supplies. However, a better rabi crop is expected to ease pressure on food prices. P.K. Padhy, senior economic adviser at the department of industrial policy and promotion, which is responsible for releasing the WPI data, said the current trend may continue for some time. “The increase in inflation is mainly due to higher food prices. Prices of manufacturing products have also started going up though it is not alarming as yet. This trend may continue for some time though prices of some food items like vegetables may come down by next month," Padhy said. Finance secretary Ashok Chawla said the government is concerned about rising inflation, but there is no need for any emergency action at this stage. “So, it is not as if we are taken by surprise or there is any cause for any special emergency action," Chawla added. Citigroup India in an advisory released on Monday raised its inflation forecast to 8% from its earlier projection of 6%, “if the current sequential uptrend is maintained". RBI in its second quarter review of monetary policy 2009-10 in September has projected that baseline WPI inflation will touch 6.5% “with an upward bias", up from the 5% forecast in its first quarter review in July. However, analysts call for urgent policy response. 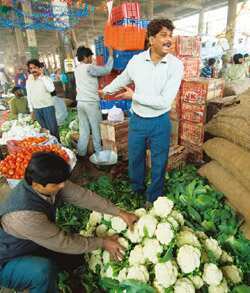 “Food (price) is crucial in any economy, especially in the Indian economy. The present high food inflation calls for immediate increase in (food) subsidy and strengthening of the public distribution system. Government may also liberalize import of certain food items so that supply is increased," said Gurbachan Singh, economist and professor at Jawaharlal Nehru University. “Whether the present price rise is a structural problem or a short-term phenomenon requires further study and data analysis," Singh added. The Prime Minister’s economic advisory council in its economic outlook for 2009-10 had also called for “a strong supply response, a more coordinated release of stocks through the public distribution system, open market sales of public stocks, precautionary arrangements for importing some foodgrain" to ward off the increase in food prices. The government, however, has repeatedly dismissed the need to import rice. “The government has assessed the stock position of rice and decided that import of rice for (the) Central pool is not required at this stage," minister of state in commerce and industry Jyotiraditya Scindia had informed the Lok Sabha last week. The current inflationary pressure is quite different from the inflationary pressure witnessed in April-October 2008. Though both inflation episodes have been driven by supply-side pressures, the higher level of inflation last year was triggered largely by a sharp increase in the prices of basic metals and mineral oils. In contrast, during the current episode, price pressures are emanating from domestic sources, reflecting an increase in prices of food products. That is also the reason why analysts feel that advancing monetary policy action, which has little control over food inflation, is not warranted. “The spike in inflation was anticipated. The question is whether the central bank should tighten monetary policy now. Some monetary response is expected in January. But to advance it will be premature," Abheek Barua, chief economist at HDFC Bank, said. Citigroup India also projected that RBI will tighten the policy rate by 125 basis points in 2010, “given that authorities have been stressing the importance of focusing more on asset price inflation rather commodity-induced inflation".